Thanks for the Qs. KX3, doublet and vertical. Well doggone if I didn't have a blast again this month! I actually got excited and started 30 mins early at the NAQCC starting time and after finding absolutely no one, I realized what a big dummy I was. :) So when the "real" starting time arrived I started on 20 and stayed there for about 20 minutes only garnering 4 QSOs, ID, CA, and 2 in CO. All of which turned out to be double bangers catching them on 40 also. I then moved to 4 where things were still slow, but after a bit, things kicked in. With about 30 minutes left I moved to 80 and got the rest there. The breakdown for 20/40/80 is 4/23/8. I thought my score was a bit higher, but after checking I found 2 dupes. No close stations tonight except for K4BAI. The next closest was N5GW in MS and everything else was on our there. I had one QRO station ask me what all this SP was about. I filled him in and actually heard him giving another station a contact later on. Maybe he'll join us next month. Using my K2 with the W5GI Mystery Antenna at 38' again at a little under 5W. Thanks to each of you for making this such an enjoyable activity. That was a lot of fun when a 599 *really was* a 599. Many great signals on the bands Monday night. I hope to be in these sprints more often. This was my first Sprint in almost a year. Seemingly good conditions this evening. My only problem was a big IF feed through signal on my ATS-3 at 4914 kHz which I could not reject on 40M! There must be a SWBC station on this QRG which peaked right on the selectivity nose of the receiver and caused no little consternation. If I could not copy some of you, this was the reason. Guess I need to build a high-pass filter to fix the problem! Conditions seemed to be good with 20M open at the start of the contest. It was nice to work Randy, K7TQ, Dave, K1SWL, and Jim, W5QLF on two bands. If anyone needs a 2XQRP contact confirmation with Iowa, I’m good for it. Thanks to all who participated. Hopefully, we will see all of you again in April. Weighing in at one pound six ounces using an HB1B, managed to make 22 Contacts which more than doubles February's total. Same so-so antenna (EFHW, inverted V-style at 22 feet apex), I was limited to 40 and 20 meters. Propagation was certainly different from February. Did not hear upper east coast stations beyond W3KC in MD. Nor did I copy upper West coast. States worked were CA, AZ, TX, CO, MS, GA, FL, MD, IA, AL, MN, NC, and ID. Close stations to me included W5QLF ( twice), WB5BKL, and N5EM. Big sigs were N5GW and AB9CA. Called it quits at 0330Z. The March 2015 Spartan Sprint was one of the best in a LONG time! I had SIX contacts on 20M, EIGHT on 40M and FOUR on 80M. Band conditions were excellent. Although 20M sounded a bit dead before the event, things really got going when the gates opened at 8PM CST. I could faintly hear N5EM making a contact, but not enough signal to connect up across town. Conditions on 40M were quiet with a bit less QSB than 20M with super CONUS coverage. When I finally went to 80M, the QRN was bad, but stations in TX, GA and OH sounded great. I worked AC8AP (OH) on all three bands – nice signal for sure. The 170 mAh LiPo batteries in the ATS-3a are still a bit “puffy”, but they topped off nicely before the event and held solid for 3W out, to the end. While I was digging around for connectors to hook up the Bird Wattmeter prior to the Sprint, I found two new 200 mAh LiPo batteries, so I will be ready with replacements when the current batteries finally give out – due to abuse I am sure. 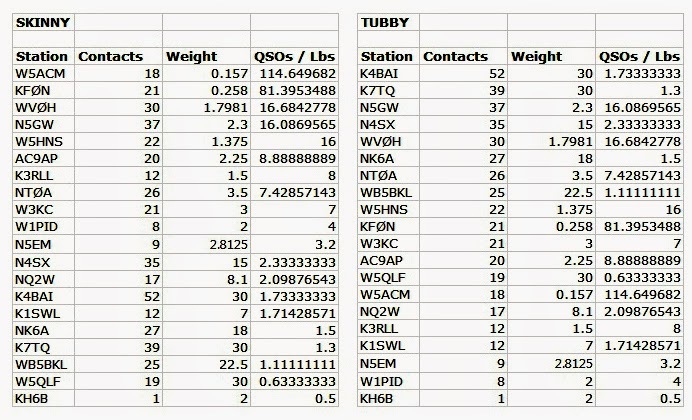 Heard a lot of stations on 20M H&P, never could get them to stay put and call CQ. 40M very good, but some terrible periodic QRN. Made one call on 80M with my no-so-good wire and was not even heard. "Big Signal On the Band Award" From here goes to AB9CA. Just plain loud! I haven't been active lately. At 0209 UTC I contacted John, K4BAI, for my only QSO in the sprint. According to info on QRZ: distance from kH6B to K4BAI is 4,369 miles. My station is a KX3 with a vertical antenna. Only 20 seemed to be open here during the SP. I tried to QSO WVØH in CO, but no QSO. This is the only activity heard here. Also tried 40 during the last half-hour. I heard mainland signals buT none in SP. Aloha! Much better activity this month. 20M was good to the west and far north at the start. 40M was quite good all over including about 125 miles to N4SX. 80M was good too, but not many stations QRV on 80. K7TQ couldn't hear me calling him on 80. Worked KH6B on 20. Best DX on 40 was CA. Best DX on 80 was W1PID, and Jim was logged on three bands.QSOs by band: 20M:8 / 40M:34 / 80M:10. Thanks for all QSOs. Weird condx on 20 meters. Best DX NK6A in CA. Operated for a half hour with KX3 at 5W. Thanks all for the Qs. QSOs on 80/40/20. IC703 (5 watts) to 90-ft doublet up 24' via EFJ Matchbox. 20 meters activity seemed kind of light and signals were not as strong as Usual but 40 meters seemed much better down here in Florida tonight where the temp hit 81F today. (Sorry – but that’s the trade off for severe antenna restrictions in order hide from the snow all winter.) Big signals Were KFØN and AB9CA, always consistently strong. Thanks for an hour of fun. Great to hear so many folks on tonight. I imagine the longer daylight hours helps. First hour was very good. Second hour was not so very good. In spite of trying hard, N5GW and I tried, I could not get anyone on 80. Thanks to all who stopped by and catch you next month when I hope to get up in the mountains for an outdoor Spartan Sprint. I have decided to sell the MFJ-9200 rig and return to my old favorite, the K1. But before I got on I stripped it down this last weekend. I removed the unused battery option and tray so I could "skinny" up the station a bit. I ended up with a total weight of 815.6 grams (1.7981 lbs) with my LGNokSung cell phone battery conglomeration weighing 74.1 grams. That made a difference. I worked some guys on 20m and then down to 40. K1SWL, Dave, was a good catch and then there was Jim, W1PID out there in NH. Don, NK6A was kind of copyable as well as a local, NØTA, John. Gene, N5GW was good here from TX as well as WB5BKL. Then Bert, K6CSL was a little weaky squeaky here into the Front Range of Colorado, but bagged him. Oh wait, this isn't a fox hunt. I really appreciate ARS putting this on every month. To all a good day and we will see you on the air soon. KX3 with internal batteries & ATU to CFZ. Got six QSO's on 20 early on, and six on 80 late in the sprint. However most of the action was on 40 which had a low noise level and many strong QRP signals. A few Texas stations on 40 including W5HNS sounded like locals, even with the attenuator on. 80 was not very noisy even during rain, but usually not many ops there. K7TQ was on 80 near the end, but he couldn't hear me. I got Will, NQ2W, on all three bands. It was good to hear so much participation. 14 states in the log. Texas wins with 7 Q's. GA with 4 and CO with 3. NH and NY the furthest I worked. I ran 5W. Three stations ran 3W. I had one 100 W station who got caught up in the fun. Maybe we can convert him to a QRP participant next month. I operated for 1 hr., 15 min. K1 at 5 W to a 2-element mini-beam at 25 ft for 10, 15, and 20 meters, an inverted V at 40 ft for 40 m, and near bottom-loaded, ground-mounted vertical for 80 m. Started on 20 for 3 QSOs south and west. Then to 40 for 10 QSOs mainly from the south. 80 netted 4 QSOs all to the south. The QRN was loud on 80, making copy quite difficult. Two-banders with AB9CA (20 & 40) and with K4BAI and N4SX (40 & 80). Had a three-bander with N5GW - 80 meters was tough, Gene, but I believe we made it. If not, maybe next month! Think spring and hope to hear you all - and more - in April. K3/10 @ 5W to a 20M wire delta loop, a 40M dipole or a 40M extended double Zepp. A slow start on my part Monday evening.Most of the QSOs on 40M this month - 16 states total. No 3-banders this month but several doubles. Removed the single QRO QSO from my score. Best signal again this month was N5GW. Nice to hear a few more new-to-me calls. My thanks to all. Had fun.